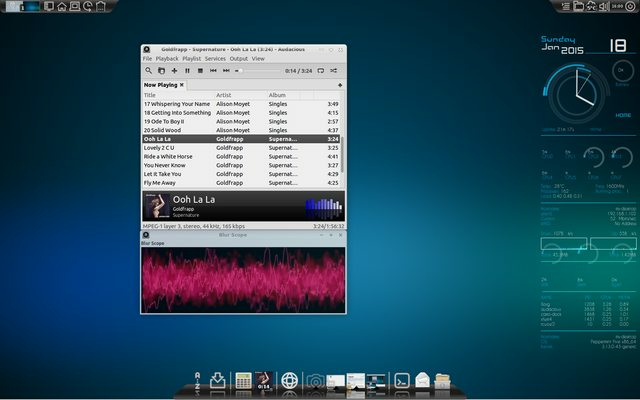 Conky Manager + Cairo dock makes it really easy to have a slick, customised desktop in no time. I had tried manually fiddling with Conky in the past but the manager makes it a doddle, especially as it comes with lots of themes. Cairo Dock (use Software Manager and search for Cairo and install from there. The dock I'm using is Meebo). and/or any other info/resources necessary to duplicate your "look". There is also a link on that page to conky manager v2 'theme collection'. Download this collection, then copy or move to your Home folder. From here, right-click and 'Extract here'. This will put the themes into the (usually hidden) Conky folders which live under Home. In Conky Manager, go to Themes and (to get the background I am using) choose the one half-way down the list called 'Mytheme.desktop'. Tick the box. The Conky script itself I am using is also included, called: '4&2core blue/conkyrc'. This will make more sense when you have the prog installed (basically there is a drop-down of widgets and you can preview each one - the one I am using is that one). Note that Conky Manager is modular. You can pick/choose/mix/match Conky 'widgets' to use. Also hit the 'Options' command (top right of program) and choose option to Start on startup. Cairo dock (downloadable via software manager) has a theme option after you install it. Choose 'MeeGo' (this is the theme I am using in the above pic - it auto-installs the top 2x docks and the bottom dock. Nothing else to do other than choose what applets you want (by right-clicking in the dock area and following the options which are fairly intuitive). If anything unclear (to any one) let me know! So there's no specific icon set you've installed to get that look ? Yeh, the theme MeeGo comprises that icon set (and you can turn off other behaviours of the 'theme' if you so wish, top docks etc, to just be left with the buttons). Hmm seems there is an icon-set as such - I've just checked the installed folders. As attached. Can you work with these, sans Cairo? I'm assuming so but not very familiar with customization (though I know you will be! ). cool i couldn't get conky to work with out conky manager either, i find it much easier to set up. or applets so but i find it to be more reliable and it dont see it hogging any resources on my machine like some people say. How do you install GTK themes by the way? I notice you had them in your posts? I can't figure that out. I like Cairo dock *but* all the whizz-bangs with the animation stuff I find offputting. Is hard to know what you have open and right-click-close gives you no end of menus. So I want to simplify that. I do like the icons (as per my screenshot) but not having them jump all over the place and be static (like on your shots) at the bottom of screen would be ideal. Can you advise on that? Thanks! Hi the easiest way to explain GTK theme installation is to point you towards the, Peppermint User Guide Chapter 3: http://peppermintos.com/guide/customize/. I hope this helps . Thank you - I had searched on the forum quite a bit but never noticed the user guide!!! Have checked it out and used it, thanks. Yeh, simple is the way to go, agreed!